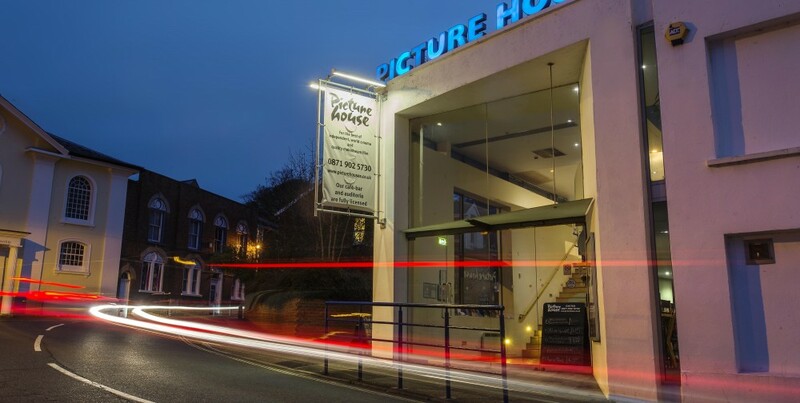 The next Screen Talks event will be on Monday 3rd June at Exeter Picturehouse. Alanna Skuse (Centre for Medical History and Dept of English, University of Exeter) will introduce 50/50 (Jonathan Levine, 2011). Booking Information: Book online in the week leading up to the film, call the Box Office 0871 902 5730 or buy tickets on the door (half price for students on Mondays). On 3rd June I will be introducing 50/50, a movie that tells the story of a young man diagnosed with a rare form of cancer, and his experience of that disease. In many ways, however, this film is less about cancer in a clinical sense and more about people’s reactions to it, and how being a cancer patient can alter your life in more than the obvious ways. In this blog post, I want to think about the persistence of some particular ways of thinking about cancer by comparing modern rhetoric around the disease with that found in texts dealing with cancer in the seventeenth century. Only a few weeks ago, Cancer Research UK released a new fundraising appeal, across a number of different media. The slogan is ‘Oi cancer’. In the TV advertisement, people ‘tell’ cancer, “I’m not afraid of you” or “I’m coming to get you”. The website, www.oicancer.org, invites us to contribute our own ‘message to cancer’. Cancer Research’s advertising strategy is interesting because it locates a relationship with cancer that is quite different to that we have with any other disease. In the UK, heart disease and Chronic Obstructive Pulmonary Disease account for a similar number of years of life lost as breast of lung cancer. Would a campaign which asserted “we’re coming to get you, COPD” be as effective? Almost certainly not, because despite the fact that it is, crudely speaking, a disease of our own mutated cells, we imagine cancer as something other; a disease which is in some way wilfully hostile to the body. That seeming agency is what makes cancer a disease that can be, even if only in rhetorical terms, ‘sent a message’. This illusion may seem like a modern phenomenon, of the same order as claims that ‘positive thinking’ can diminish tumours. In reality, however, it is a pattern of thought that has persisted for hundreds of years. The very word ‘cancer’ comes from an ancient Greek term, karkinos, or crab. 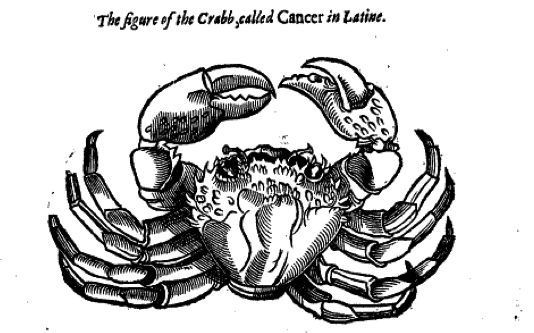 Medical practitioners in the early modern period took it as obvious that cancerous tumours were named after this creature because they were round and red, like a crab, with darkened veins surrounding the tumour which looked like legs. In addition, they noted that ‘the tumour is so rooted in the Glands of the Breast, that ’tis no more possible to extirpate it, than force a Crab to quit what he has grasped betwixt his griping Claws’. Furthermore, many physicians saw cancerous tumours increasing as the patient visibly diminished and came to the natural conclusion that the disease was literally ‘eating’ the body. From the medieval period to the eighteenth century, practitioners of various kinds claimed to have seen worms in cancerous ulcers. In 1714, one ‘empiric’, or unlicensed practitioner, even claimed to have seen a wolf poking its head out from a cancerous ulcer. So invested were early modern physicians and their audiences in the idea of cancer as purposefully intractable that the very word ‘malignant’ meant more than simply ‘prone to spread’. ‘Malignant’ encapsulated a whole range of qualities including resistance to cure, painfulness and the ability to ‘break out’ into painful ulcers. More than a clinical term, this was evidence of cancer’s ‘evil’ nature. In the twenty-first century, most of us agree that the idea of cancer as an independent, hostile entity within the body is a rhetorical one, psychologically useful rather than literally true. In the language of ‘battling’, ‘fighting’, or saying ‘Oi’ to cancer, however, we can see that historical influences on our conceptualisation of this disease are far from extinct. Pierre Dionis, A course of chirurgical operations, demonstrated in the Royal Garden at Paris (London: 1710), p.248. Daniel Turner, De Morbis Cutaneis: Diseases Incident to the Skin (1714), p.76.